The Long Beach Media Collaborative is a team of reporters and editors from four newsrooms across the city: the Press-Telegram, Long Beach Post, Grunion Gazette and Long Beach Business Journal. Convened by the Long Beach Community Foundation with funding from the Knight Foundation, LBMC supports a new model for producing in-depth, local journalism. Our first series—Strengthening the Signal—examines an unsettling shortage of Internet access within the city and considers ways to bridge the gap. Is Lack of Competition to Blame for High Cost, Slow Broadband Speeds in Long Beach? In Long Beach, choices seem to be endless. If you’re looking for single-origin cold brew coffee sold inside a brick-laden storefront, there are plenty to choose from. Need a place to have your pup primped and pampered? There are multiple locations scattered across the city. But if you’re looking for an internet service provider (ISP), that’s where things can get a little sparse. Many of the city’s nearly 500,000 residents have few choices when it comes to which company will provide internet service to their homes. A person’s internet provider is often dictated by where they live in the city, with geographic location in some cases excluding customers from some services. The lack of competition has led to stagnation in improvements and high internet costs, especially compared with the rest of the world. Numbeo, a crowd-sourced, data-collecting site that compares international prices lists the United States as the sixth most expensive average monthly bill at $55.86. 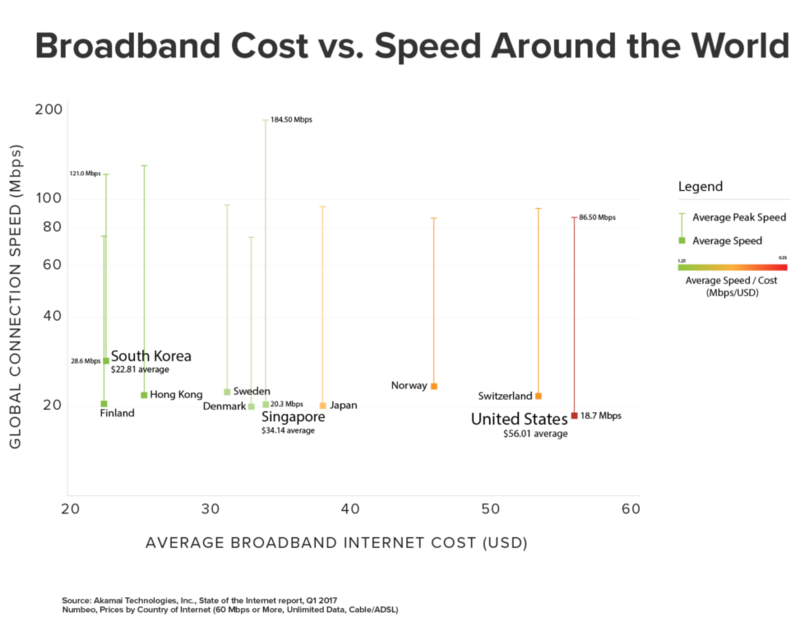 Singapore received internet for an average of $33.96 a month, and South Korea’s average monthly bill is $22.03. What’s more, both countries report dramatically faster average connection speeds. “It’s an objective fact that here in the States, even with being the home of the internet in so many different ways, we pay more for worse service than basically any other developed country in the world,” said Roger Howard, a consultant and software engineer who previously served on the Innovation and Technology Commission for Long Beach. Howard said these issues faced by customers have numerous causes. Among them, he said, are the basic lack of internet infrastructure, the steep cost of replacing old copper lines — which DSL runs through — with fiber optic cables, and the way networks are organized into shared hubs. These hubs account for the evening slow-down when everyone turns on Netflix, but sometimes it’s as simple as the equipment rented to customers. He said customers can branch out to their wireless phone providers for hot spots that are expensive and slow or possibly through their cable companies, which he said provide generally good packages which are neither cheap nor competitive. There are roughly 10 ISPs in Long Beach that provide residential internet connections. But the two largest companies that offer fixed broadband services, Charter Communications through its Spectrum brand, and Frontier Communications, enjoy a lion’s share of the market when it comes to broadband in Long Beach. The rest of the market is made up of smaller, lesser-known companies like HughesNet, Windstream, Curatel and Excede Internet or companies like AT&T and Time Warner Cable, which primarily provide television services but also offer internet. The issue with competition, or lack of it, is not limited to Long Beach and is not a new phenomenon. But when talking about the digital divide, which disproportionately affects minorities and those in lower income brackets, price and competition cannot be overlooked as it is often price that prohibits home internet adoption. In Long Beach 16 percent of residents don’t have internet access at home and a larger portion—25 percent—lack access to broadband, redefined by the Federal Communications Commission in 2015 to be speeds of 25Mbps download and 4Mbps upload. Those numbers jump when accounting for household income. The Pew Research Center reported that among households making less than $30,000 per year, only 53 percent had a home broadband connection. In Long Beach, a full 16 percent of homes lack internet connections, but when accounting for those who access the web from smartphones, that figure rises to 24 percent. Even with discounted prices advertised by ISPs many still find it unaffordable. And that’s before the line of price and promised speeds is blurred. In responses from more than two dozen locals through online polls and interviews, it seems that not everyone is paying the same price for the same service, even when they’re paying the same company. While some paid the advertised prices listed by Charter and Frontier, some paid significantly less or more for the same product from the same company. One respondent reportedly paid the advertised price of $64.99 a month for Charter service; another paid $50 for the same service. A third noted that his homeowners’ association was able to provide Frontier service (at a slightly lower speed than Charter’s) for $20 a month. A fourth said he paid $70 from Frontier. Feeding into the pricing ambiguity was the fact that if you can argue, you can often get a better price. In an email, Dennis Johnson, Charter’s director of western regional communications, said that the differences in prices charged to customers could stem from some subscribers being “legacy customers”, meaning their raters were set prior to the company’s launch of its new Spectrum packaging and pricing in September 2016. He said those customers haven’t been required to transition into the new Spectrum packages. Johnson added that the company feels at $54.99 for 100 Mbps internet when bundled with television—he said most of their internet customers bundle—they offer a very competitive price, adding that the company intends to move toward residential gigabit speeds—ten times faster than its current starting speed—in 2018 without offering specific details. A representative from Frontier did not respond to multiple requests for comment on this story. East Long Beach resident Dana Neveling detailed the dance that some have found themselves in, bouncing from Charter to Frontier and sometimes back while trying to capitalize on promotional prices and switching providers when they expire. Neveling started out with a bundled TV-internet package through Verizon before the company was sold to Frontier, at which point she switched to Spectrum. In November, she switched back to Frontier at a promotional price of $84.99 a month for cable TV and internet at a speed of 200 Mbps — double what most households have. She knows that, just as Spectrum raised the rates after the promotional period was over, so too will Frontier. At that point, her monthly bill will increase by about $50 — putting the cost at about $135, the same as she was paying with Spectrum. But this time she’s not switching back. Robert Galvan, who lives in Alamitos Beach and has been with Verizon/Frontier for the past five years, said he lives on the cusp of where Verizon stopped its fiber rollout years ago. Stuck with its slower DSL connection, Galvan said he’s hesitant to seek out the smaller operators that could be available in his area of the city. #AskLBMC: Why is fiber better than cable?#AskLBMC: Why is fiber better than cable? Another concern was that, whatever the price people are paying, they’re not getting the service that they’re paying for. Complaints of slow service and dead zones in certain rooms were constant. Kristen Coop, a 30-year-old Long Beach resident said she’s baffled to find that her router can’t cover a 600-square-foot apartment, but at $50 per month for Charter’s internet service, she feels it’s a fair price. Whether it’s ambiguous pricing, bad customer service, or just plain bad performance one common thread with people interviewed was discontent with their internet service. Consumers in Long Beach are not alone. In February the Los Angeles Times reported that the New York Attorney General had filed a lawsuit against Charter’s operations in New York for its consistent failures to meet advertised speeds. In the filing Atty. Gen Schneiderman said Charter’s Spectrum service—the largest ISP in the state at over 2 million subscriptions— “dramatically shortchanged” its customers in both speed and reliability. The suit came after a 16-month investigation in which wired internet speeds in the state were found to be up to 70 percent slower than advertised with its wifi rates being as much as 80 percent lower than advertised. The case has yet to be decided, but in June Charter agreed to an unrelated $13 million settlement with the state of New York over its failure to meet buildout requirements it agreed to prior to its acquisition of Time Warner Cable. As part of the merger Charter was mandated to upgrade its broadband speeds to 100Mbps statewide by 2018 and to triple that capacity by 2019. While neither Frontier or Charter was open to providing coverage or cost details for proprietary reasons, and did not respond to multiple requests for comment regarding this story, according to BroadbandNow.com, an online comparison and research website that tracks national broadband speeds and pricing, 98 percent of Long Beach has access to Charter Spectrum, and 88.73 percent of the city has access to Frontier. A smaller portion — 82 percent — has access to Frontier’s fiber optic network, the only fiber service in town. However, at 82 percent, Long Beach residents far outpace Los Angeles County in access to fiber. Only 22.1 percent of the county has access to a fiber network. Statewide, just over 15 percent of the population has access to fiber. BroadbandNow’s Director of Content Jameson Zimmer said that the company’s data comes from a variety of sources, but the process starts with the raw data submitted by ISPs to the Federal Communications Commission throughout the year. The company then cross-references those figures with data provided to them from both private firms and ISPs with whom they’ve cultivated relationships since the company’s inception in 2014. In Long Beach, the average download speed is 42.98 Mbps and 19,000 people have access to one or fewer wired internet options. While what a person pays for the internet and the speed they pay for is not as taboo as discussing salaries in this country, people rarely gossip about their download speeds. Zimmer said he wasn’t surprised to find that people did not know what they were paying for in some cases, or that multiple people were paying different prices for the same service from the same providers, and that part of fixing the problem is making these issues more transparent. He added that service maps can often resemble gerrymandered political districts as companies seek to limit head-to-head competition in trying to remain the best, and sometimes only, show in town. He said that companies rarely advertise the prices that result in the ending of promotional prices, if they list them at all. It’s a marketing strategy, Zimmer said, to let the customers know as little as possible about what they’re paying for and why they’re paying for it. While he said his group has noticed a shift in market practices by some companies, which in an attempt to clean up their image with customers have tried to become more transparent with their pricing and speed claims, others still operate on a case-by-case basis. Meaning, if you’re willing to call Frontier and sit on hold with for four hours, a retention agent might be willing to slash your bill dramatically. This author can speak to that, having recently used this method to successfully lower his monthly bill by nearly half—$119.99 to $64.99. Websites like BroadbandNow are attempting to create grassroots transparency in an otherwise opaque industry. Zimmer hopes this eventually will lead to a more utopian situation where there is real competition in the broadband market and where people are aware of their choices. When looking at the cost of a home internet connection, it’s important to look at the cost of service relative to its speed. 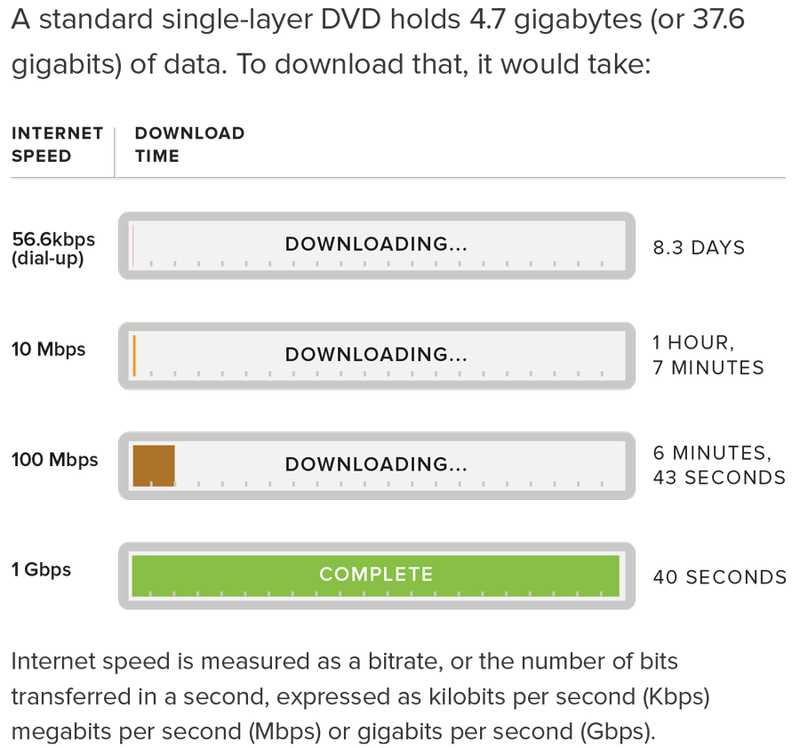 Internet speed is measured as a bit rate, or the number of megabits transferred in one second. For instance, a high-resolution photo, such as one you might send to a friend from your cellphone, might be around 24 megabits (Mb) — so on a connection with a top speed of 12 Mbps upload and 24 Mbps download, it would take at least two seconds to send the photo, and one second to receive it (not accounting for other network traffic going to and from your device). For Charter, its internet-only advertised prices start at $64.99 per month for 100Mbps download speeds ($69.99 if you want WiFi), a price reduced by $10 per month if combined with Spectrum TV. The company also offers a program called Spectrum Internet Assist 30Mbps service for $14.99 per month ($19.99 with WiFi) for households with children receiving reduced cost-lunch or adults under the age of 65 receiving supplemental security income. Frontier’s lowest advertised price is $19.99 per month for speeds “as fast as 6 Mbps.” Its site lists a 12 Mbps option ($29.99 per month) and a 24 Mbps option ($39.99 per month), as well as its FIOS service which ranges from $39.99 a month for 30 mbps to $89.99 a month for its “Simply Broadband FIOS” service which provides upload and download speeds “as fast as 100 Mbps”. In June, PC Magazine released its rankings of the fastest ISPs of 2017 which found Hotwire Communications to be the fastest major ISP in the country. With service to a handful of states on the East Coast, the company scored an average 91.3 Mbps. The next nine companies on the list, including Charter Spectrum (40.3 Mbps), all scored below 50 Mbps. The United States currently ranks 11th on the speedtest.net monthly global rankings for average fixed broadband speeds. At 74.68 Mbps, the US sits behind countries like Romania, Iceland, South Korea and Singapore, which leads the list with an average download speed of 148.62 Mbps.